David Clarke is back at Bretton Gate. Peterborough Town have re-signed prolific opening batsman David Clarke for the 2015 season. Clarke helped Ramsey to the Cambs First Division title last summer, but has opted to return to Bretton Gate after a one-year absence. 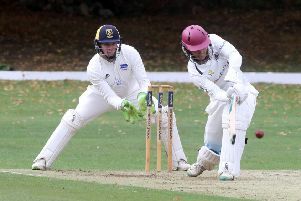 He made his name at Town as a classy and determined stroke-maker and he will add substance to the top of the order in a team who will be chasing a fourth successive Northants Premier Division title. Clarke scored over 600 league runs for Ramsey last season. He scored over 800 league runs for Town the season before. Town have also re-signed top-class professional Paul McMahon for a fifth straight season. Former Nottinghamshire player McMahon has been a key man in Town’s recent successes with both bat and ball. He’s a former captain of the England Under 19 side.